The proceedings start off with a bang; Bono, David Bowie, Bruce Springsteen, and Chuck Berry are among the first to offer insights into the rock movement. And, as the 10 hours forge on, Bono and Springsteen reappear fairly consistently throughout the series, helping to put things into context from the points of view of two guys who went from modest means to icon status. While at times the series feels more like a roll call than a true historical documentary, it’s at its best when it pulls the social and cultural influences into the picture. This is particularly effective with the scandalous entry of hip-swiveling Elvis Presley side-by-side with a film clip of what was deemed proper dress for 1950s teenagers. Dungarees and black leather quickly get the shaft as the apparel of evil-doers while prim and proper dresses and dress pants adorn those deemed to be the nation’s good girls and boys. The early goings are pretty well covered, from Alan Freed coining the term “rock ‘n’ roll” to the payola scandals; from race battles and the British invasion to Jimi Hendrix and the Summer of Love. Even early on, it becomes apparent that business and rock would have a turbulent relationship. Thankfully, a small business man and record store owner, Brian Epstein, saw the potential of those Liverpudlians, The Beatles, and forever changed the planet’s musical landscape. The ’70s also offered plenty of fodder. Oddly humorous is the account of Peter Frampton’s success, which unwittingly ushered in a new wave of musical interest from Corporate America when Frampton Comes Alive! became the biggest selling album up to that time. After all, when the smell of money is in the air, corporate copycats are always quick to come along with their shovels. Interviews with the likes of Pat Boone, Ozzy Osbourne, Neil Sedaka, Ben E. King, and even Leiber and Stoller are peppered throughout, adding color and firsthand recollections to the historical footage. Most of the time, those interviews put a shiny, happy glow on rock’s history. Standing out from the pack and shedding light on some of rock’s dark past are the impassioned comments from Pete Townshend as he talks about his friends who died along the way. Janis Joplin. Keith Moon. Jimi Hendrix. Jim Morrison. Mama Cass. They all died too young and with too much untapped potential. Ironically, Townshend’s comments were followed by a segment on the continuing success of the Grateful Dead. The series, which also features interviews with Jerry Garcia, was released just before his own untimely passing. The series could have used more of Townshend’s passion. There’s a breezy spin put on rock’s history that shies away from most of the struggles, the tragedies, and the behind-the-scenes tide of events that carried rock’s heroes to the forefront. Instead, the “later years” cave in to too much coverage of MTV and Salt ‘n’ Pepa. Can rock ‘n’ roll change the world? According to artists from bands like The Cars, Devo, and The Byrds, the answer is “no.” But that’s a cynical way for the series to end. Rock has already changed the world many times over and it will continue to do so by broadening minds, young and old alike. In some respects, rock ‘n’ roll is the story of every day life, told on a grand scale, in three-minute chunks. Without it, there would have been no mop tops wreaking a path of pandemonium across the Atlantic and around the world, no raising “popular” awareness of various causes through global events like Live Aid, and no sense of empowerment for the Children of the Revolution who dare to imagine a wonderful world of truth, beauty, freedom, and love. 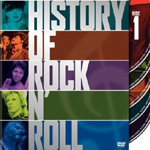 Even though plenty is left out in this condensed rock history, The History of Rock ‘N’ Roll is an ambitious collection that at its worst offers an invitation to dig deeper elsewhere into those subjects that impact the viewer the most. At its best, the series captures the excitement of rising talent, new forms of expression, and the chaos of the world which rock ‘n’ roll both reacts to and pushes back upon. The DVD set would fail Jack Black’s School of Rock when it comes to extras. That’s all the more disappointing when considering the set was released to commemorate the 50th anniversary of rock ‘n’ roll and it only covers the first 40 years. The series was first released in 1995. Since then, there’s been a whole decade of musical growth, experimentation, scandals, and mistakes. It’s a shame this was not capitalized upon. A new disc covering the past ten years, picking up where the series ends in 1994, including the fringe artists (Marilyn Manson and Alabama 3), white rappers (Vanilla Ice and Eminem), and pop tarts (Britney Spears and Christina Aguilera) would have been ideal. Also, the series thumps its chest as having been assembled from 10,000 hours of live and archival footage. That leaves 9,990 hours worth of material on the cutting room floor, footage that could’ve easily formed some sort of supplemental feature. Think Live Aid. Think We Are the World. Think Lennon. Instead, the only “extras” are Spanish and English subtitles and chapter stops. Given the set’s hefty $99.98 list price, there could have and should have been more. The series has been remastered in Dolby Digital 5.1 Surround Sound, but it is overall a weak surround sound with very little coming out the rear. The audio is more often limited by its archival audio recordings than opportunities to shake the rafters. On the same track, the video fares slightly better. Although some of the more recent clips and interviews show the graininess of their original source video material, ironically, some of the older film clips look as good as new. One example is a fairly grainy contemporary interview with the Righteous Brothers, the picture quality of which pales compared to the black-and-white archive footage of the boys performing live. Overall, the DVDs could have used a little more tenderness in the presentation. Most embarrassing are the copyright notices at the end, left in tact from the VHS edition and looking like relics of a bygone era.